Though not formally recognized as a breed of dog, Cockapoos, a cross between a Cocker Spaniel and a Poodle, have been bred since the 1950s. Breeders have taken the best traits of Cocker Spaniels and Poodles and breed them into the Cockapoo. From the Poodle side, the Cockapoo takes intelligence, relatively little dander and an almost non-shedding coat that comes in many colors. From the Cocker side, it takes a sturdy build and friendly and loyal personality. 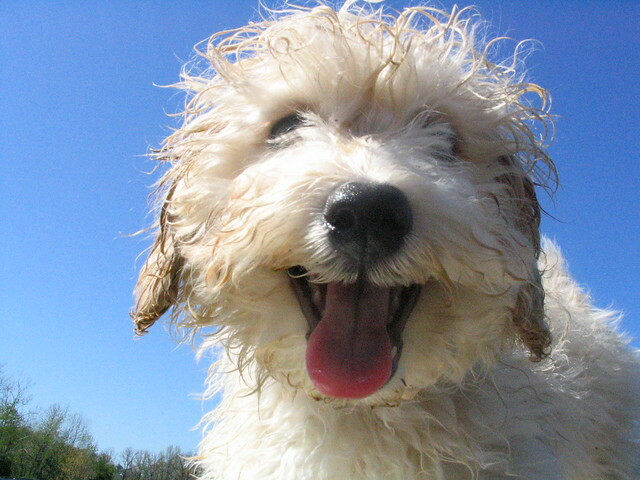 A crossbreed like the Cockapoo is also less likely to have many of the genetic problems that purebred breeds do (something called hybrid vigor). In fact, other than the normal care for a dog (grooming, cleaning ears, safety, exercise) Cockapoos have no particular health concerns, though it should be noted that without consistent care and cleaning of the ears, Cockapoos can develop ear infections, thanks to long floppy ears from the Cocker Spaniel side. Cockapoos can live 18-22 years and come in different types: Teacup Toy (height less than 10 inches and weight under 6 pounds), Toy (height 11 to 14 inches, weight under 12 pounds) and Standard (height over 15 inches and weighs over 12 pounds). Since the Cockapoo is a mixed breed dog and there is currently no breed standard, there are variations in the build of the dog ranging from slim to stocky. The Cockapoo can also be bred with three different coats: a tight curly coat, a medium curl and a flat coat. Though different in style and color, all of the coats are less likely to shed, making them consideration for allergy sufferers. However, Cockapoos, like all dogs, will have dander (though considerably less than other breeds of dog), a potential allergen. The longhaired coat should be trimmed regularly to prevent matting. Cockapoos enjoy being around people and their intelligence makes them easy to train. Though active dogs, Cockapoos do not require large outdoor spaces to run around in and are good in apartment settings, provided they are walked at least once a day. It is the friendly personality - as well as forgiving nature and loyalty - that makes it an ideal family pet for those with children and other animals. Even when left alone for extended periods of time, Cockapoos are generally not destructive, though can become anxious so crating is recommend if leaving a Cockapoo alone for more than four hors at a time. Just the same as our own eyes, your Cockapoo's eyes are extremely sensitive and require good care and attention. In this article I'll be sharing a few points and suggestions to ensure that your Cockapoo's eyes stay in a healthy condition and infection free. Examine the sides of your Cockapoo's eyes and make sure they're totally free of mucus. Unwelcome bacteria will rapidly grow in the mucus and this could potentially be transferred to the eyes. If your dog suffers from a mucus build up, then ask for the local veterinarian's help and advice. They will typically suggest a sterile eyewash that will allow you to eliminate the mucus. In your Cockapoo is a little 'intense' in the presence of other dogs, it is important to maintain good control of your dog, since eye traumas sustained from fights can be extremely unpleasant - regrettably many a dog has lost an eye via some sort of 'scrap'. Does your dog constantly ride with his or her head out of the car window? If this is the case then its very easy for small particles to enter his eyes, which could cause infection or injury. Likewise, larger objects such as the branch of a tree or a rock thrown up by another vehicle, could cause a more severe injury to your dog. Take care not to expose your dog to substances which are potential irritants, so consider where it is that you walk with him, what is on the ground, or what fumes may be in the air. Take a set of blunt scissors and then clip the hair from about your pet's eyes. Doing this will help to ensure that any long hairs will not prick against your dog's eyes and may also help to prevent unhealthy present on the hairs microbes from coming into contact with his eyes. Tear stains are a problem in Cockapoos simply because this breed of dog does not possess good tear duct drainage. Any tears that cannot drain away merely roll down and off the eye and may lead to staining around the eye, because the damp hairs attract and accumulate debris and dust. You can easily help alleviate problems with this discoloration by simply making certain that the hair surrounding the eyes is frequently cut. If the discoloring is high then there are several commercially obtainable solutions and products which can help. You should always check with one's veterinarian for help and advice before of applying any sort of treatment solution on your dog. By routinely checking your dogs eyes you'll be able to spot any issues before they get serious. Should you see anything amiss then I suggest you contact your vet's as soon as possible. Eye problems in dogs are actually commonplace, with the most typical being conjunctivitis. Eye infections are usually bacterial and will be easily cured with antibiotics. The antibiotics will either be in liquid or in a lotion. Eye bacterial infections will certainly clear up a lot quicker if your dog is not able to scratch or paw at their eyes. You should get a cone collar because they will put a stop to the dog itching at their face. It will also help in preventing the problem from moving from one eye to the other. The above facts are presented as a general guide. For anybody who is unsure on precisely how to care for your Cockapoos eyes then make sure that you talk with your veterinarian. They can describe for you all of the symptoms of the commonplace eye ailments, along with the symptoms that you need to be looking out for. They'll also be able to demonstrate the ideal way to cleanse and maintain your dogs eyes, so that they remain healthy and problem free. Poodles are a very popular breed to have as a pet and also very popular to breed with other dog breeds. To learn more about the popularity of the poodle see the article on this site at Poodle Popularity. Although there are not Breeds of Poodles, there are plenty of Poodle mixes. One of the most popular poodle mix is the Cockapoo described in this article. By mixing the breed of poodle with the breed of Cocker Spaniel, a Cockapoo is created. The Cockapoo is not a dog breed, rather it is a mixed breed and in theory takes all the desirable qualities of their parents. In reality one hopes the mixed breed dog will take the desirable traits of the purebred dog. From the Cocker Spaniel, the mixed puppy will hopefully take Cocker’s characteristics of being mellow, friendly, having a pleasant personality and a sturdy build. The Poodle bred traits wanted are intelligence, cleverness, and a non-shedding hypoallergenic coat. The poodle’s coat is a major reason the poodle is mixed with other breeds. The poodle’s coat does not shed and is hypoallergenic, meaning the poodle is (in my opinion) the best dog breed to have if you suffer from allergies. Most people will not have an allergic reaction to a poodle. By mixing two breeds Cockapoo Puppies become less prone to genetic disorders. Poor breeding, like mating a brother and sister, is a cause of genetic disorders. Breeding with a completely different bloodline from a different breed strengthens the gene pool of the puppies. When Poodles became a popular dog, this caused a very high demand for poodle puppies. Poodles were generated for money not health. Inbreeding and unhealthy breeding occurred rampantly causing genetic health problems for future generations of these poodles. The same poor breeding was done with Cocker Spaniels as their popularity grew. Known health ailments are associated with each breed due to breeding to meet demand versus breeding to advance the quality of the breed. It is possible to obtain a healthy purebred. Proper breeding was also done at the time of the breed’s popularity. By researching the bloodline of the parents, and/or having both sire and dam registered with the AKC can insure healthy genetic bloodlines for the purebred puppy. Remember, by mixing the breeds, the traits you like about a breed will not necessarily be passed on to the litter. Combining the best traits of both breeds is the goal. Some of the mixed bred puppies will have the desirable traits, or may have one or two of the desired traits. It is hoped that by mixing a poodle with a Cocker Spaniel, the cockapoo will have a coat that is non-shedding and hypoallergenic, be very intelligent, be friendly and have a sturdy build. Some cockapoos will have a less shedding coat and will be less likely to cause allergic reactions. Some cockapoos will have a shedding coat and will cause allergenic reactions. The same is true of all the traits. Cockapoos are not a recognized dog breed. At least not yet. If cockapoos with the desired traits are bred with other cockapoos with the desired traits from a different bloodline, then over time the cockapoo will have predictable traits. For example, all pure bred poodles have a non shedding coat and is hypoallergenic. The pure breed Cocker Spaniel has a shedding coat and will cause allergic reactions. As of now, cockapoos may or may not have a non shedding coat, or a coat that sheds less than the Cocker Spaniel. Researching the breeder of the cockapoo and seeing the parents is the best indication of the traits of a specific cockapoo puppy. The mix of traits will be in each litter and puppies in the same litter could have different characteristics. One may have a shedding coat and one may have the non-shedding coat. One puppy may be very active and another calmer. Well bred cockapoos are calm, fun, mellow and loving. They are pleasant, have patience and very sweet. Their intelligence helps them be trained and entertaining. A personality of a dog is mainly dependent on the parents. To predict personality meet the parents and take time to get to know them. There are Cocker Spaniels and Poodles that are skittish, nervous and not friendly, who will pass on these undesirable traits. There are known health issues for each breed who will pass on the genetic tendency for that health problem. By spending time with the puppy before committing a great deal of heartache can be avoided. Cockapoo puppies can be taken care of with weekly bathing, brushing and clipping of nails. They can live a healthy and a long life with proper nutrition, medical care and good living conditions. Cockapoo puppies have a very good immune system so they are less prone to diseases. They remain healthy with regular physical exercises. The cockapoo needs physical activities and loves to play. At a minimum take them for a daily walk, and have space for them to run and play or take them to a dog park. The nature of Cockapoo make them ideal for kids. They love to be with children and will be an excellent companion. The personality traits of calmness and patience can make the cockapoo an excellent choice for a child with emotional challenges, such as being withdrawn or autism. The cockapoo can make an excellent therapy dog. Cockapoo breeders can become state licensed or register with the American Cockapoo Club as a way to show they are knowledgeable breeders. Cockapoo breeders breed healthy well socialized puppies in a variety of colors and coats. Research the breeder and ask lots of questions until you feel confident about the puppy you are about to buy. Saying a dog is a Cockapoo does not exactly imply purebred Poodles and Cocker Spaniel parents. Many cross breeds of poodles have more than one breed in the bloodline. See if the breeder has a hereditary chart of the parents, called the sire and dam. It is worth taking the time to examine breeders. Be sure the cockapoo is healthy and pleasant mannered. A well breed cockapoo will be a loving wonderful addition to your home. Take Care. Discover the potential hazards of commercial dog food, and what you can do to make sure your dog is safe!